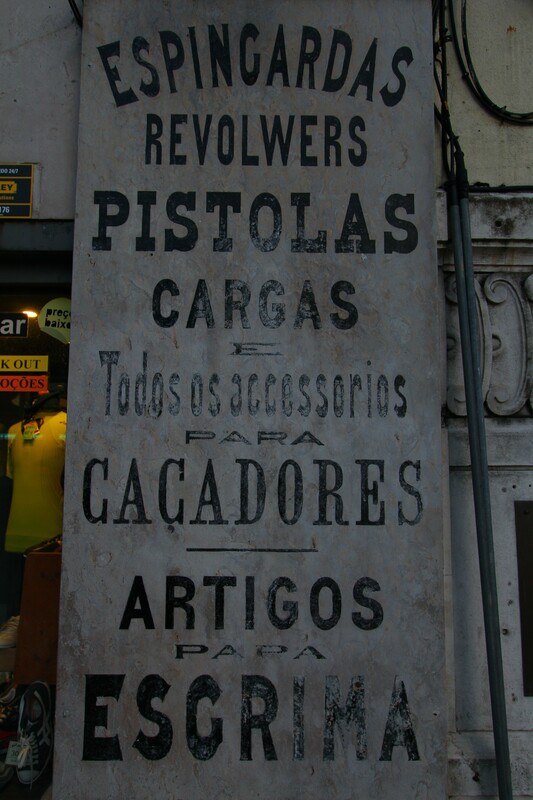 My husband loved this sign next to the cafe downtown Lisbon where we ate steamed pork buns our last evening. Despite having been to mainland Europe several times and having explored most of Western Europe, I somehow always missed Portugal. I thought it was comparatively expensive when I was first traveling abroad in 2005, and I thought it was difficult to get to by train from everywhere else when we were backpacking in 2007. 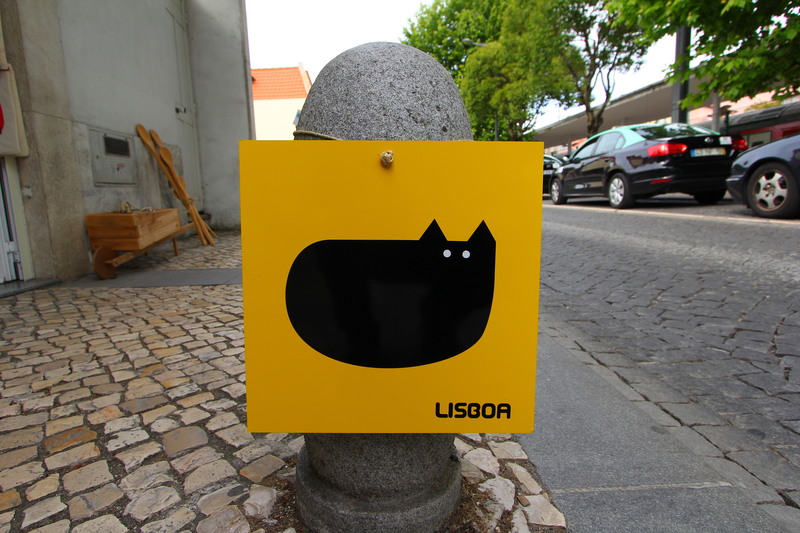 In any case, it was the last major country in Western Europe I wanted to visit, and we sneaked it in just before my 30th birthday as part of my goal to visit 30 countries by the time I turned 30. I was surprised at how much I enjoyed it. 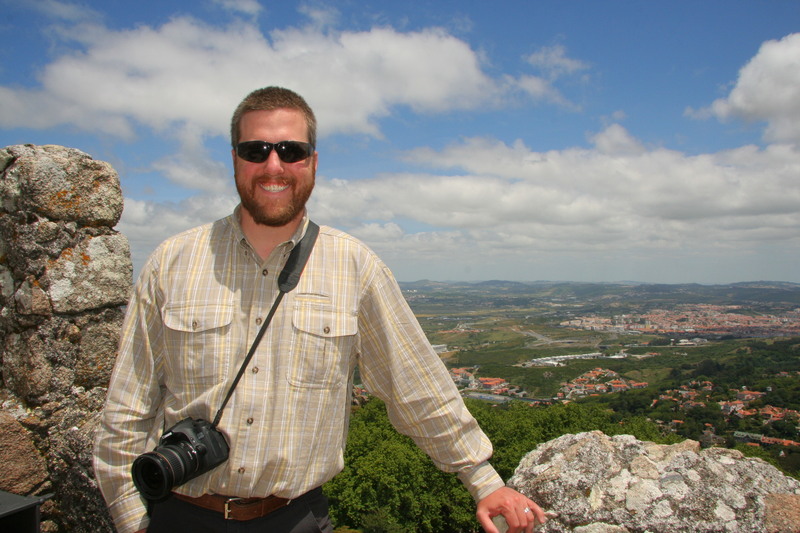 I had been so looking forward to Morocco, that Portugal was sort of the bonus ending to the overall trip. 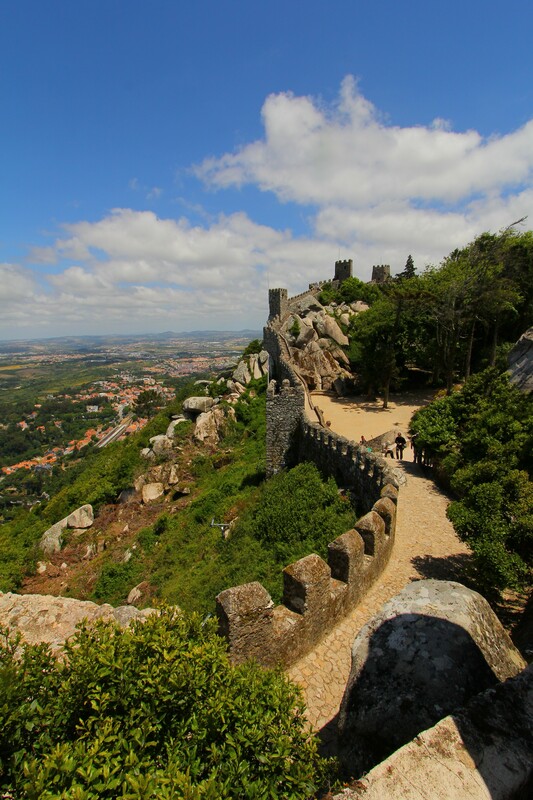 We were only there three days so our sight-seeing was limited to our home base of Lisbon with a day trip to Sintra (most everything in Lisbon is closed on Mondays, while everything in Sintra is open on Mondays, so it’s a perfect day to take a trip out of town!). 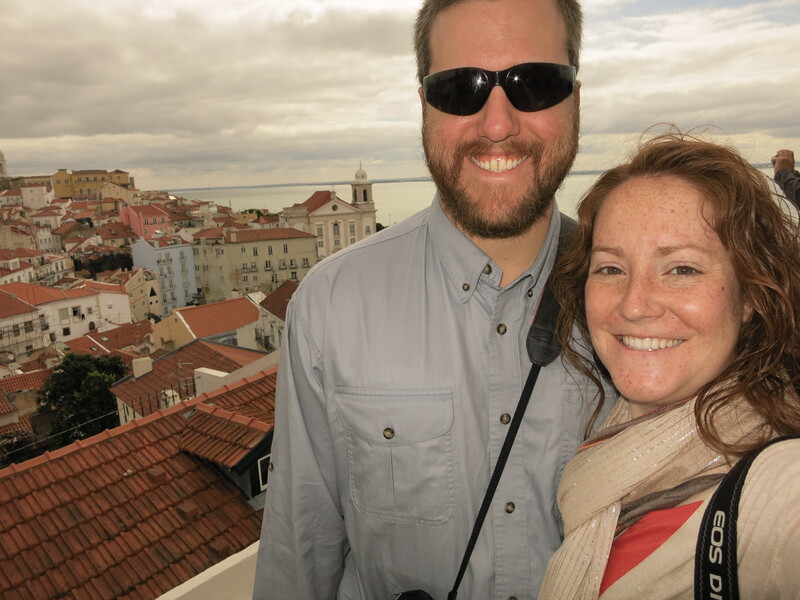 We stayed just north of downtown Lisbon to be closer to the airport for our VERY early flight home our last day, but it was quite simple to walk to the nearest metro and take a quick trip to the heart of the city. We flew in from Tangier and spent our first afternoon just acclimating to the transportation, finding the train station and figuring out the three neighborhoods we wanted to visit, and then headed out for some non-stop exploring the rest of our stay. We had really nice weather–not too hot or cold, and it only rained briefly our last night. We had pork buns under a small awning at a shop just across from the train station and then drank port and Maderia with some accompanying pastries for hours under the awning of a small cafe on the main square to end our last evening. We just talked and indulged while we watched people running by amid the raindrops, and it was a beautiful end to the whole trip, rain and all. 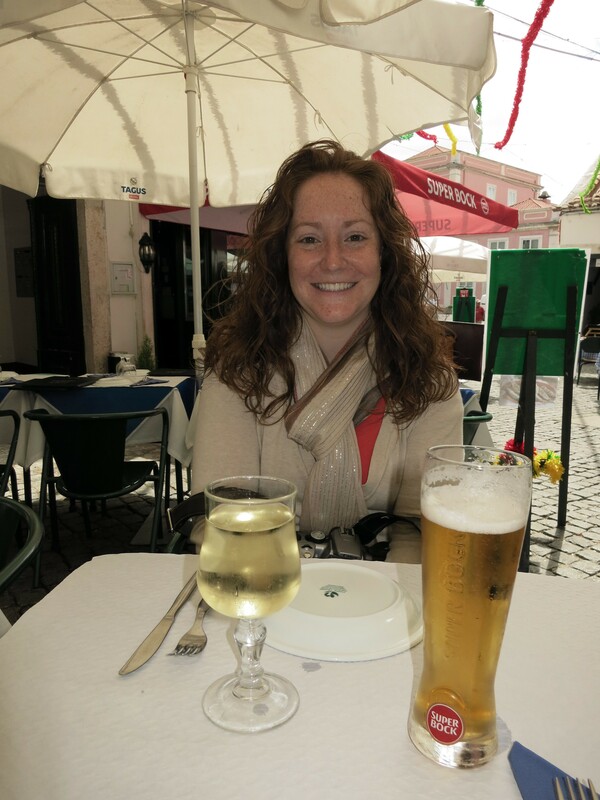 I can’t believe I’m saying this, but I would love to go back and do a longer trip around Portugal and Spain. There are so many coastal stops, amazing food and music, and a lot more to the culture than I’m aware. I could easily see us spending a relaxing two weeks exploring the countryside. 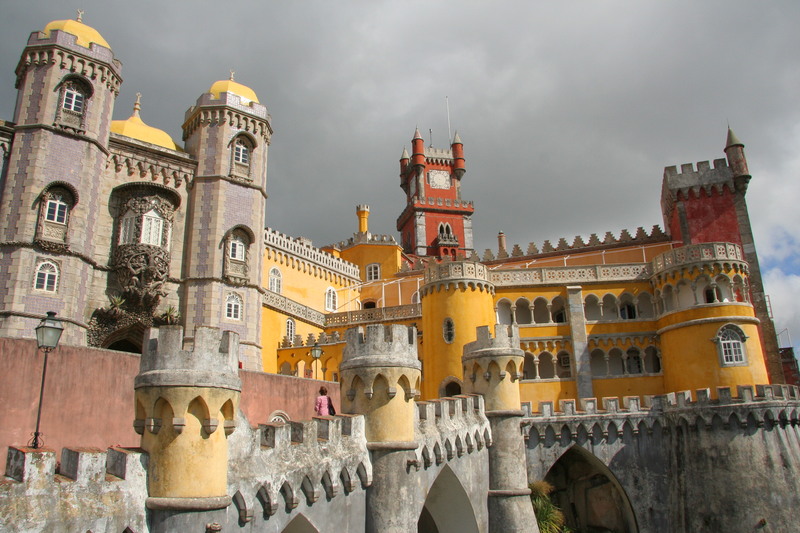 Our day trip to Sintra began with a train ride to the small city and then a bus to the incredible Pena Palace! 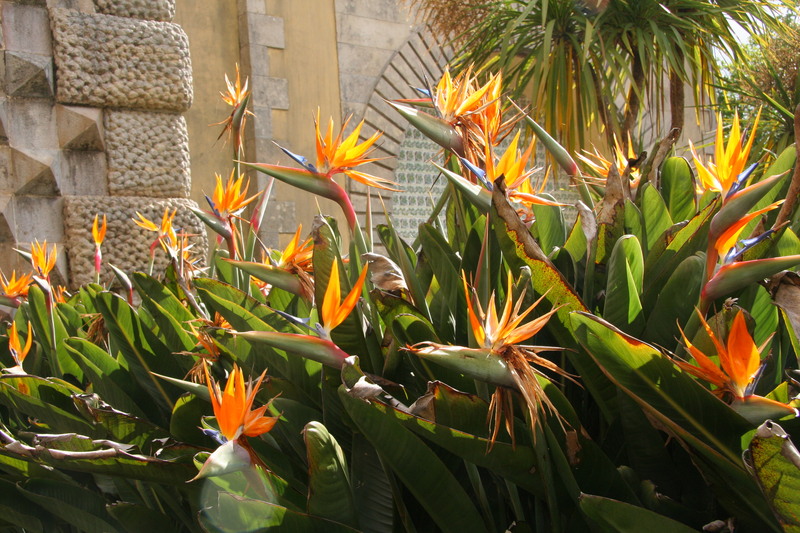 As we took pictures and waited to get in, I couldn’t help but admire the many blossoming Birds of Paradise. After our self-guided tour of the palace we explored the palace grounds and hiked through the woods up to the very top of the hill/mountain to the cross. 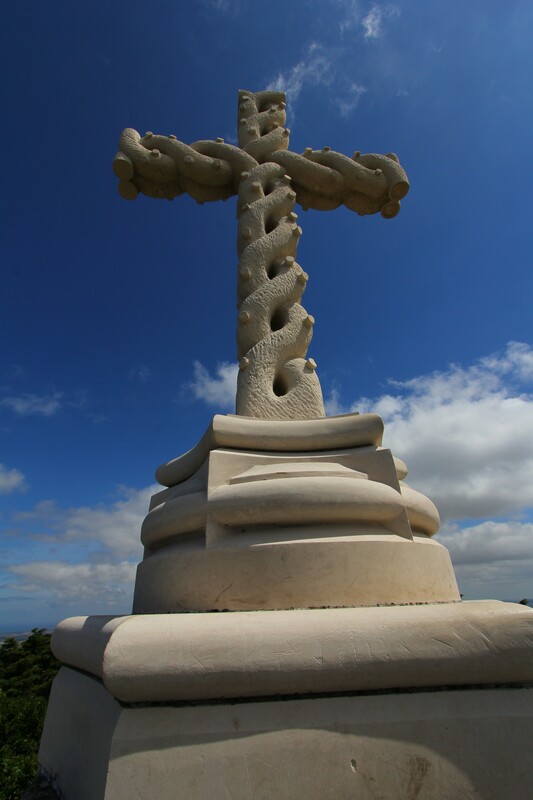 From the cross, our view of the surrounding countryside and the Moorish Castle. 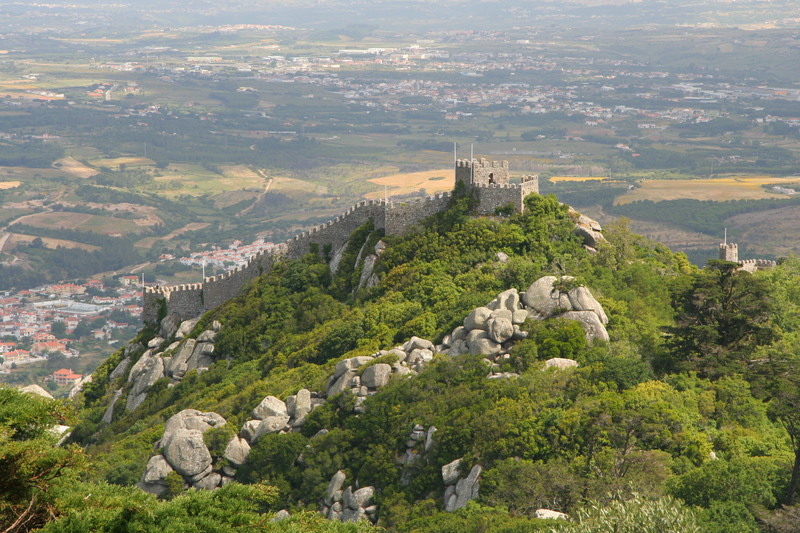 The Moorish Castle is really the remains of the former fortress’ walls, which you can climb for amazing views. My husband looking out over the beautiful countryside from the Moorish walls. 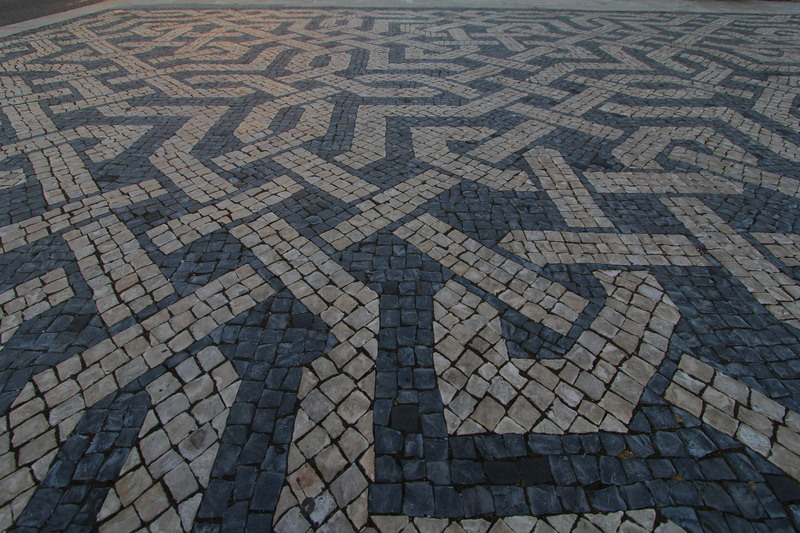 We loved the crazy black and white squares indicative of Lisbon. We read that people actually got sea-sick walking on them when they were first installed long ago. 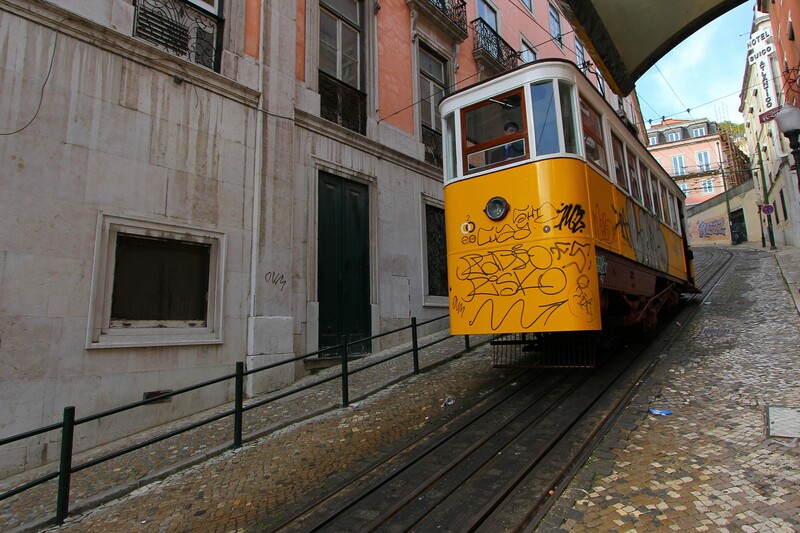 The next day we explored the three main neighborhoods of Lisbon, beginning with a funicular ride to Bairro Alto. 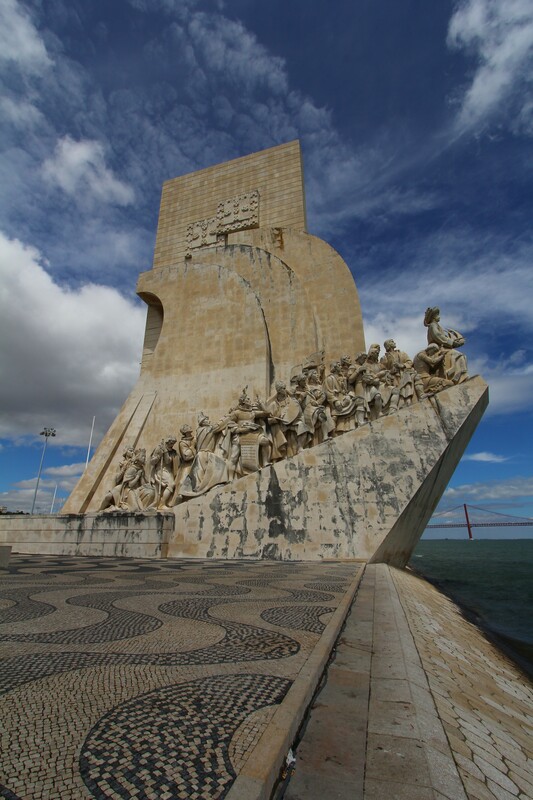 After exploring the Bairro we took a tram over to the Castelo de Sao Jorge, but opted not to go in after reading the reviews. 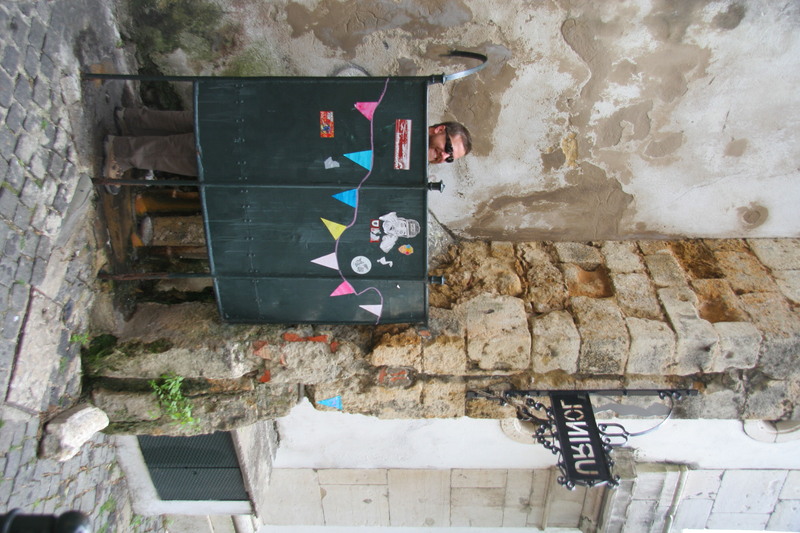 My husband found a hilarious public urinal–with running water! From the castle we wandered down the winding hill of the Alfama district and ended at a little cafe for lunch. We tried the sardines and shrimp pasta along with local beer and wine. 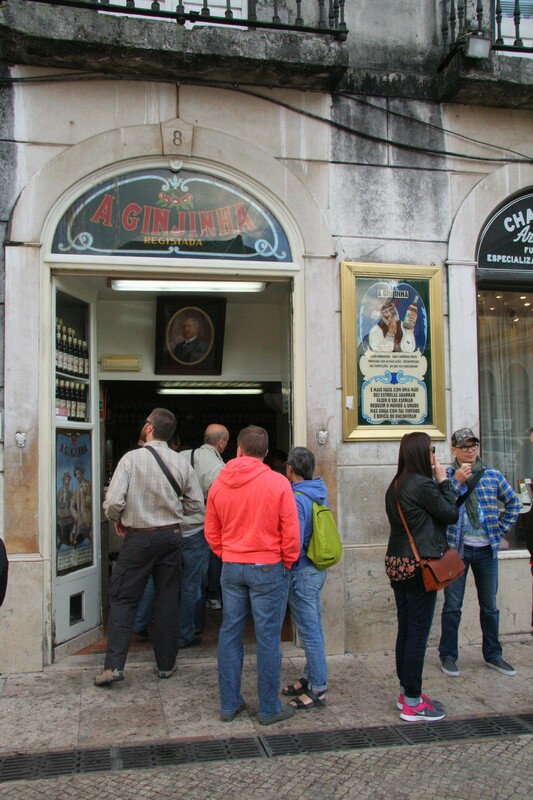 There were two things we understood we must eat and drink– pastel de nata (custard tarts) and ginjinha (fruit liqueur). We had both in spades–yum!! 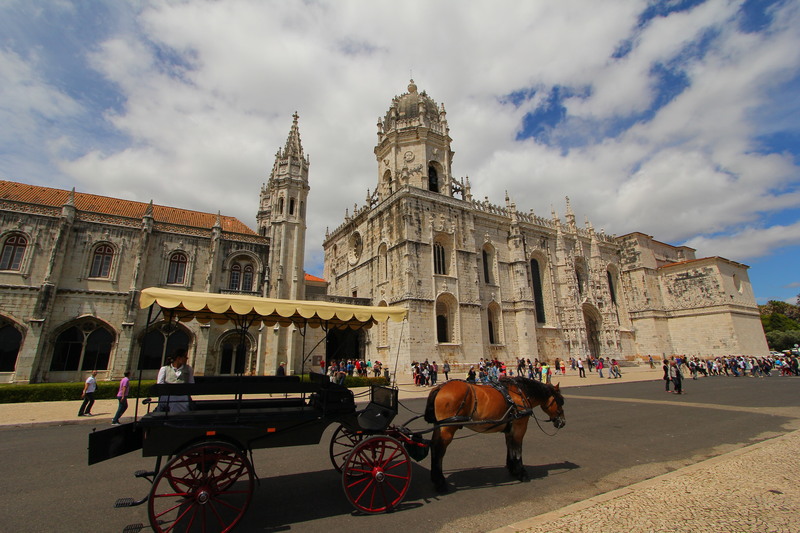 We took a very hot tram ride to Belem on our last day to see the monastery and tower. It was beautiful! 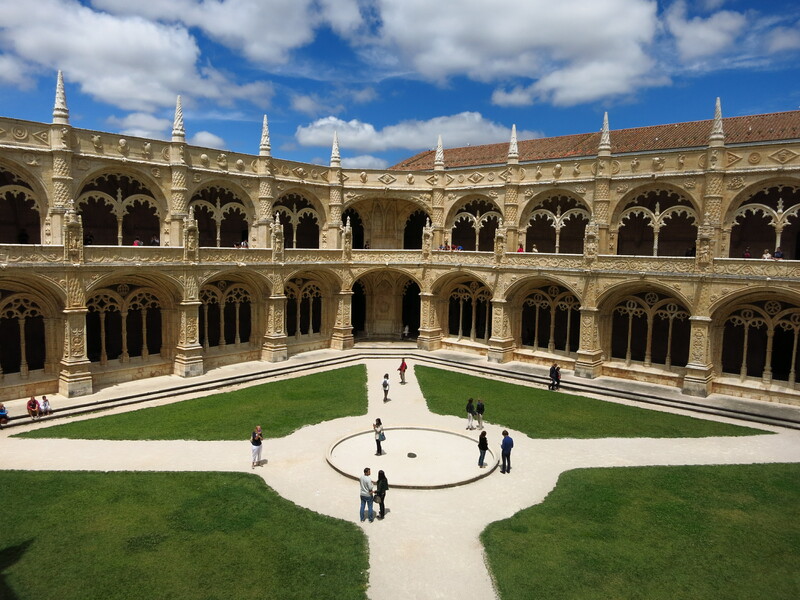 The courtyard inside the monastery with incredible architecture and lots of tourists! Although we didn’t climb to the top, we did enjoy the Monument to the Discoverers along the river. 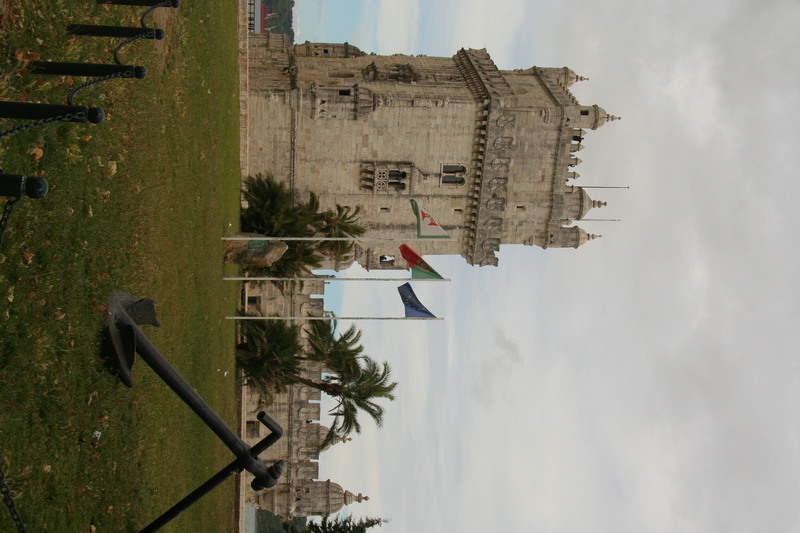 We ended our time in Belem at the Tower of Belem, which was accessible only by taking some small footbridges out into the river. We climbed to the top and then grabbed some photos from the riverside.